As a consequence of the Economic Growth and Tax Reconciliation Act of 2001 (2001 Tax Act), the federal government eliminated the estate tax credit for state death taxes paid after 2004. 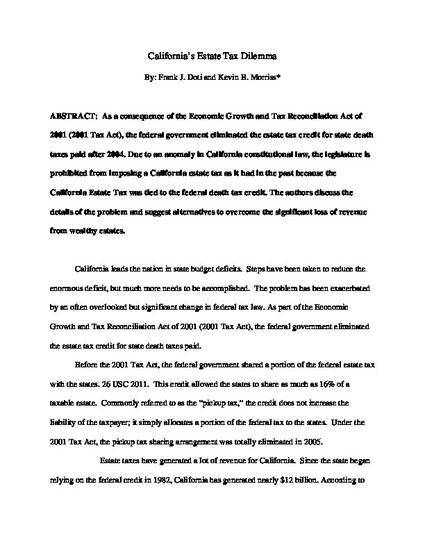 Due to an anomaly in California constitutional law, the legislature is prohibited from imposing a California estate tax as it had in the past because the California Estate Tax was tied to the federal death tax credit. The authors discuss the details of the problem and suggest alternatives to overcome the significant loss of revenue from wealthy estates.